The new MacBook Pros are here! These new MBPs (MacBook Pro 2010 if you’re checking the listinsg) are sporting i5 and i7 cores for the 15″ and 17″ models as well as a new generation of Nvidia GPUs. A lot of people have already been expecting a refresh of the Macbook Pro line ever since the little Macbook got it’s upgrade in hardware. Apple’s update throws in everything but the kitchen sink! Here’s a rundown of the specs for the new Macbook Pros. Notice anything different with the i5 and i7 models? If you noted that there’s 2 GPUs listed there (an Intel GPU and an NVIDIA one) then you win a prize! These top of the line models have dual GPUs but you’ll be only using one at a time. How do you decide? Well you don’t need to worry about it if what Ars has reported is indeed true. Apple’s approach in the new 15″ and 17″ MacBook Pros differs from Optimus in two key ways. The first is that the switching is all handled automatically by Mac OS X without any user intervention (though there is actually a System Preference to deactivate it, if you choose). Apps that use advanced graphics frameworks such as OpenGL, Core Graphics, Quartz Composer or others will cause the OS to trigger the discrete GPU. So, when you are reading or writing Mail, or editing an Excel spreadsheet, Mac OS X will simply use the integrated Intel HD graphics. 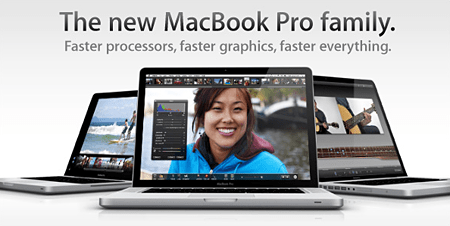 If you fire up Aperture or Photoshop, Mac OS X kicks on the NVIDIA GeForce GT 330M. In short, OS X will handle the switching for you. Not bad as most of the implementations that we’ve seen using dual GPUs involved restarting your computer or in the latter months, flicking a switch. Having the OS handle everything is a definitely a notch above the rest.